Will I go to Sabarimala? Will I go to the shrine of the forest-lord, if Reshmi Nair comes chanting ‘Ayyappa bro’? Will I go there, after 41 days of vows – during the period eating food cooked by menstruating women – even if the new generation of Kerala’s feminists will come smoking their hookah? The ‘trip’ alias ‘pilgrimage’ to Sabarimala is a tradition – much like Onam. Come Vrishchikam 1 (mid-November), Kerala gets an air that is palpably devout. Makeshift pandals are set up and Ayyappa songs fill the air. There would be an ‘Ayyappa’ pandal in every town, every village, every community. Taxi drivers would have their own, the headload workers will have theirs. To each a pandal. Ayyappan is like the proverbial Mahabali. He doesn’t differentiate anyone on any count; if you are a devout, even if you do not go through the elaborate 41-day rituals of penance, you can still go to the temple. No one is going to take stock. No one will question if you observed the full 41 days or not. After all, faith resides in one’s heart, and the extent you go to uphold a vow is your own calling. You can break it and feel bad; you can uphold it and feel good – and anything in between. It is your choice and Ayyappa gives you the free will to practice as you please. When it comes to such devotion, although Ayyappan is ‘Malayali’, the ardent faith of those who arrive from Tamil Nadu and Andhra Pradesh gives you goosebumps. They wear black all through, discard footwear, and even walk all the way from their hometown, only for that ‘one second’ darshan before a burly policeman shoves them out of Ayyappa’s way. If you are richer or have influence, you can buy/gain your way closer to the inner sanctorum, as everyone who has a ‘friend of a friend of a friend’ in any policeman on duty will tell you. That is why you see mini-celebrities being escorted inside and out even as millions stand in queues all the way down to Pampa. 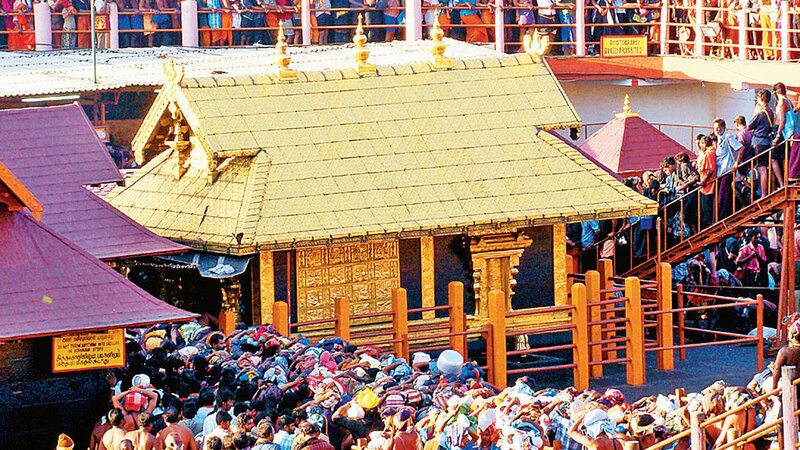 Discrimination in Sabarimala is not just for women – it is also for the have-nots. Everyone is equal before Ayyappa but not before his mortal protectors – the policeman, the Devaswom board officials, the CRPF men who guard the shrine with machine guns, why, even the media, who get uncalled for privileges when it comes to pushing in their friends and folks right down Ayyappa’s nose. Have I enjoyed that perk? I cannot say no with full conviction because I too have tried to influence my way in. But after the first time, I dropped out of that. Not because of any moral high ground – but because I felt – as I feel every time I see a celebrity in any temple -be it Guruvayoor or Sabarimala – that the one fundamental any Almighty would want from us is to be ‘just mortal’. A temple should be the last place where influence should matter. I may be naïve but let me stand firm on my naivete. The landmark Supreme Court order allowing women in the menstruating age of 10 to 50 to go on a Sabarimala pilgrimage has, however, achieved what no other communal-driven tactic has in Kerala. It has divided the state’s Hindus, and it has converted many a fence-sitting ‘secular’ Hindu to embrace the ideology of ‘Hinduism’ and probably in due course vote for BJP. That obvious seems to be lost on the intellectuals and the free-thinking women of Kerala. NS Madhavan’s outpour citing old Tamil films and raising allegations of casteism, discrimination et al at Sabarimala must have miffed more Hindus (including liberals) for the simple reason that suddenly, here is an intellectual, deep-diving into matters of faith with arguments of logic. So it is that social media posts by the so-called feminists and the new wave of intellectuals led by Aashique Abu, Saradakutty et al, are seen not for their face-value by many but for their intellectual posturing that no one really needs in blind faith. And if you thought Buddha was utterly non-misogynist, maybe Armstrong’s book will reveal otherwise – especially in relation to his predicament to allow women to be nuns. He relented, of course, but only after apparently stating that the Sangha would have lasted 1,000 years without women, and now it might go on only for 500. Well, I must say that this is a simplistic reduction of a more profound argument and as with any thing, place and person in history, we often only take what we want than try to sift through the silences and glaring holes – as is needed. I do not for a second believe that the fundamental issue here is about allowing or not allowing women in the menstrual age to enter Sabarimala. Nor is it a debate about menstruation being some distressing sin or evil. He perhaps missed the point. In old homes, there was a custom of the elderly who go to Sabarimala – after undertaking a grueling 41-day session, during which menstruating women do not cook for the fasting men. They used to set out to Sabarimala as if they are on their last journey. Sabarimala was the Makkah for the Hindus. One never knew if you lived to tell the tale. So it is not uncommon to find photographs or portraits of these grand old men prior to their trip having a pride of place in the puja rooms. But I am yet to find a picture of a woman – a young menstruating woman – among those photographs. Surely, if women were allowed in before 1972, in the reformed land of Kerala, where women rights got a fillip under the Maharanis of Travancore, they would have ventured out to Sabarimala. As for the Maharani herself going to the shrine in 1115 ME (that is 1940 CE), does anyone know whether the Maharani (Sethu Paravathi Bhai) hadn’t already entered menopause. She was 44 then. Further, most records of women going to ‘Sabarimala’ in the days of yore for ‘choroonu’ are really of them arriving at Pampa (as many women have been doing even prior to the Supreme Court order) and not progressing to the forest-shrine. So then, back to the question: Will I go to Sabarimala because menstruating women are going to come with me? I will because, now, if I am going to Sabarimala, I will not see ‘women’ there – I will see Reshmi Nair as a Malikappuram. But whether Reshmi should go is her choice: If she wants no one will stop her. But should she or her comrades? That is a matter of faith that has nothing to do with menstruation but is rooted in whether you are self-realised enough to respect the faith of that 80-year-old Swamy from Andhra Pradesh, who trudges all the way to meet his Lord Ayyappa. The Naishtika Brahmachari who rules the Sannidanam has nothing against women. If you can hold your head down, look at the toes and nails of the women (as Ecclesiastics famously recommended to Christians), Sabarimala and Lord Ayyappan will await you with all his glory as you want. After all, vows, celibacy et al start and end in one’s mind. Ask ourselves, how graceful we can be to each other. That will decide whether you want to take to the street or mock at believers. That will decide if you want to prove your intellectual prowess and social media savviness. The more ungraceful you are, remember that, you are strengthening the schism of Hindu fundamentalism creeping into the minds of the so-called exalted Malayalis.